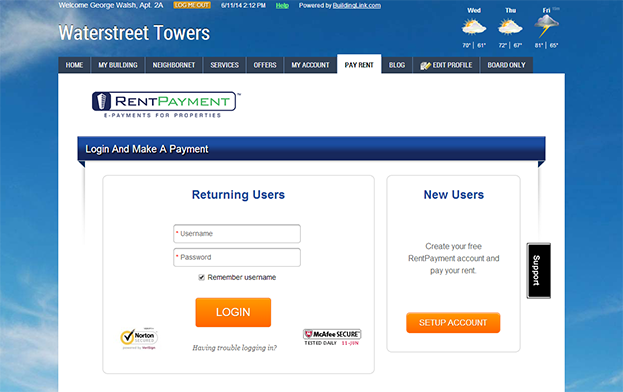 Below, you'll find some information about the features on our "Resident Portal". Remember, management can enable or disable particular Resident Portal options via their Site Setup page, to meet the needs of their specific building. Residents can navigate to their BuildingLink Custom Login Page via a unique web address created specifically for their building. Your login page will be designed to feature a hi-res photo of your building using a color theme and style that matches your buildings personality. 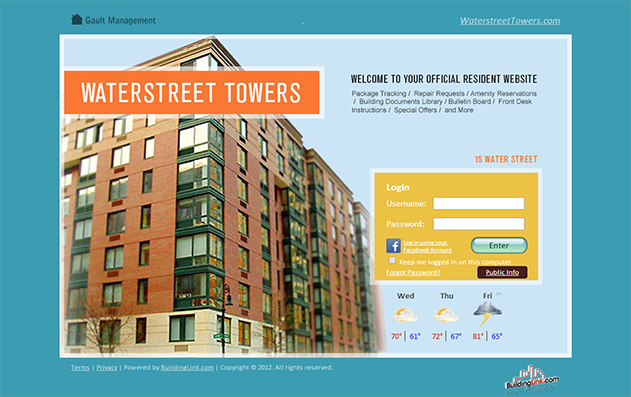 The homepage is revealed to residents immediately upon logging in to the site. On their homepage, residents can quickly catch up with what’s new in their building, interact efficiently with building staff and local service providers, and update their personal profiles. 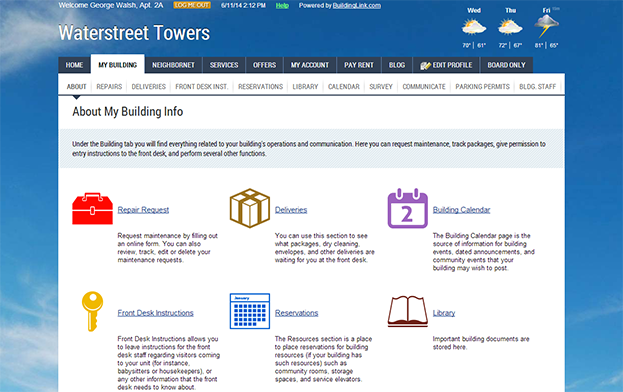 Under the My Building tab residents find a suite of features related to interacting with their buildings management and maintenance staff. These tools represent the bread-and-butter of building and offer residents an unprecedented amount of power. 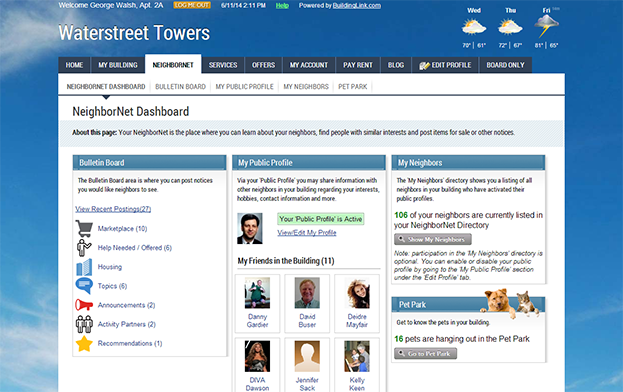 The NeighborNet is the place in your building’s site where residents can get to know each other by sharing information about their interests, hobbies or jobs, and by exchanging “Friend” requests. Residents can also post items for sale, submit help-wanted requests, or make announcements in the Bulletin Board section. Via the Services Tab, Residents can submit requests directly to any concierge service provider or local vendor that you choose to integrate into your BuildingLink site. 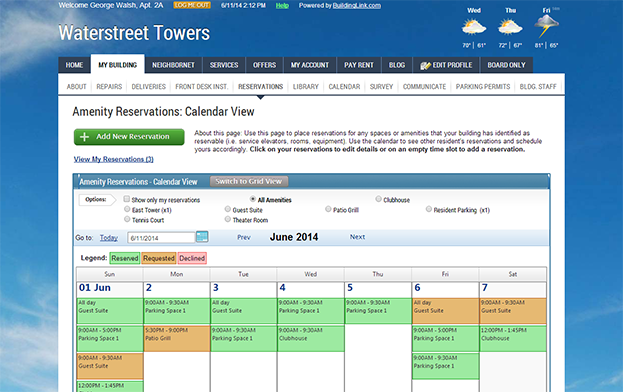 Using the BuildingLink Advantage Network local business such as restaurants, vets, gyms, etc. can sign up to distribute discounts specifically to your buildings residents. 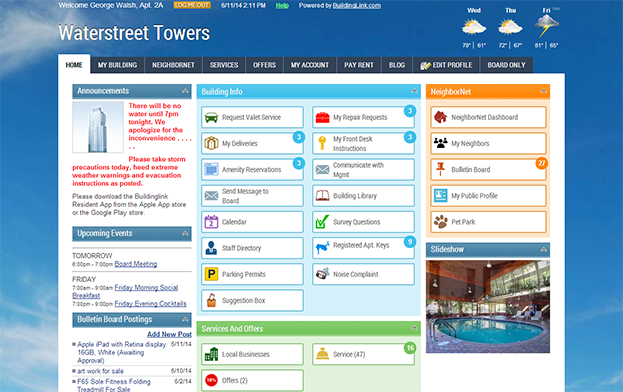 BuildingLink is a highly customizable system and the Profile is a coherent view of everything a resident can personalize. Here they can set their notification preferences, contact info, emergency contact, and more.